The Exidor 297 is a surface mounted rim latch suitable for application of both double and single doors. Merely depressing the pad gives a safe and speedy exit for emergency situations, whilst also keeping great security against intrusion. It comes supplied with an adapter for use with a rim cylinder for outside access. With these push pad panic latches, it is easily accessible for fire emergencies. 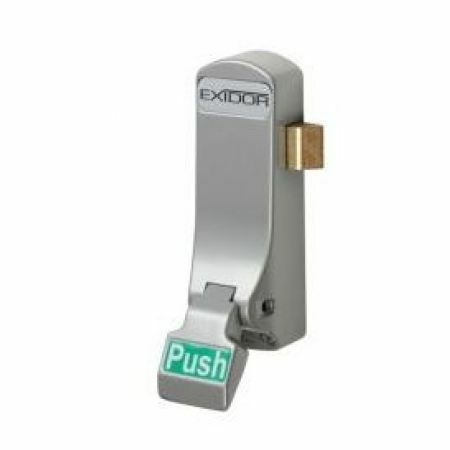 But whatï¿½s unique about this Exidor 297 Silver Push Pad Panic Latch is that it does not feature a bolt, all you simply have to do is mount it into the door and this is great if you want a simple easy task to do. Quick delivery, well packaged, robust well made product. This panic latch is fantastic, I wouldn't ever use any other type.